Senior Technical Specialist Terri Neibauer prepares to load specimens into the Roche cobas® 8100 system. The team already has assurance they made the right choice. “The initial perks of the Roche system were practical. It takes the place of numerous analyzers we had all over the lab, each one serviced by a different company with its own procedures,” says Thomas Stipe, manager of the Department of Pathology and Laboratory Administration at the Milton S. Hershey Medical Center. Starting in 2015, Stipe and his laboratory team members made trips to several other hospital systems to see the system and its competitors in action. The new system—which, when added to renovation expenses, totaled over $6 million—has resulted in significant improvements in laboratory function. For example, simply reducing “flagged” samples from 20 percent down to 10 percent means technicians have 500 fewer samples they need to manually review and interpret each day. And that’s not all. The new automated system has direct implications for patient care—the team’s primary consideration in upgrading the lab’s equipment. Heart attack patients need to get from the door of the Emergency Department to a catheterization lab within 90 minutes. Before they can do so, however, doctors need to know for sure if it’s a heart attack. To find out, they draw blood for a cardiac troponin test and await the results. Thanks to the new automated system, they’ll be waiting 11 minutes less from now on, meaning patients in the midst of a heart attack can get appropriate treatment that much sooner. Since its late February debut, the cobas 8000 has also enabled faster results for patients on the operating table for parathyroid removal, shaving 10 minutes off the time to complete an interoperative parathyroid hormone test. Since the procedure can’t be completed until the results come in, that time savings is advantageous for patient safety. Heart attack and parathyroid surgery patients aren’t the only ones to benefit. Certain tests that used to be run only a few times each week during normal business hours, such as those for hepatitis or insulin levels, now come through 24/7. And since the system doesn’t rely on human intervention to match results to patient records or move things from one machine to another, most patients will have results reported to their physician faster than in the past. The new Roche cobas® 8000 Chemistry Analyzer and 8100 Pre-analytical System process lab samples faster and more accurately, ensuring that patients get appropriate treatment sooner. The Roche system operates fairly independently. When it receives a sample, robotic arms scan the barcode to register all ordered tests and immediately start processing the sample. The system then sends the sample down the line to whichever instruments are required for the ordered tests. When testing is complete, the cobas 8100 refrigerates and discards the samples as appropriate. 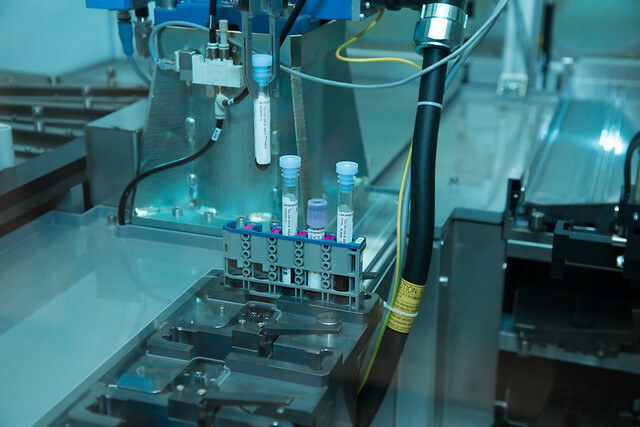 In time, the system may also be programmed to automatically identify and set aside samples for research. The ability to focus on improving patient safety is paramount to the laboratory staff, who take their role in the patient’s experience and overall health very seriously. All of the five dozen technicians who touch the new system on a regular basis had to attend two weeks of training classes to learn to use it. After all, the machine is no good without experts who know how to make the most of it. They do a good job of it, too. For 18 months, the Hershey Medical Center laboratory was under renovation to prepare for and install the Roche system. In the meantime, the lab staff continued processing thousands of daily samples without a hitch—with saws and hammering just opposite a plastic curtain at their backs.